Possibly (sale, Wawra, Vienna, 17 December 1900, no. 204). Hermann [1860-1953] and Gottfried [1862-1924] Eissler, Vienna, by 1908. Possibly Honig collection, Vienna. (sale, Wawra, Vienna, 17 March 1917, no. 165). Acquired 1970s in Switzerland by John and Paul Herring, New York. The picture is first associated with the Eissler collection of Vienna in Arthur Roessler, Ferdinand Georg Waldmüller, Vienna, 1908. According to Rupert Feuchtmüller, Ferdinand Georg Waldmüller 1793-1865, Vienna and Munich, 1996: no. 137, the Eissler picture was later acquired by the Hitler's Sonderauftrag Linz. However, this Linz provenance should be associated instead with Feuchtmüller no. 136, "Portrait of a Cartographer and his Wife," now in the possession of the Westfälisches Landesmuseum in Münster. No. 136 is another version of the dual portrait from the same year with almost identical dimensions as the NGA picture. Although similar, the compositions are distinguished by the dress of the woman, what she is holding in her hand, and the background, among several other differences. Feuchtmüller no. 136 is illustrated on the Web site lostart.de, which lists those objects returned from the Allies to the German government after World War II and still in German Federal custody. On the Web site the Waldmüller is listed as Munich no. 9536, meaning that it was recovered by the Allies and processed through the Munich Central Collecting Point as no. 9536. The property card for no. 9536 indicates that the painting was Linz no. 2306 and had been acquired for Linz from the Galerie St. Lucas, Vienna, in 1942 (copy in NGA curatorial files). The picture was turned over to the German government in 1948 and remains the property of the Federal government on loan to the Münster museum. This information is confirmed by communication with Birgit Schwarz, author of Hitlers Museum, in which the Waldmüller figures as no. XVI/34. There is no doubt that the Feuchtmüller catalogue erroneously associates the Eissler picture with the version that was in the Linz collection. The National Gallery picture, Feuchtmüller no. 137, figures in a 1917 sale at Wawra, Vienna, of an "important Viennese collector." In a copy of the catalogue in the archives of the Österreichische Galerie Belvedere, Vienna, the painting is annotated as having sold for 26.000 Kronen. The files at the Belvedere also include another annotation to this sale as follows: "Auktion Wawra 1917 (Honig)." This suggests that Honig was either the buyer or the seller in 1917. In either case, the picture would have left the Eissler collection by that time. In Frimmel's 1913 Lexikon der Wiener Gemäldesammlungen it is already noted that of the many Waldmüllers owned by the Eisslers, some had already left the collection. The 1925 estate sale of Gottfried Eissler included several Waldmüllers, but not the one in question, and there is no reason to suspect that the Waldmüller re-entered the Eissler collection after 1917. The name Honig may refer to the Jewish Viennese collectors Josef (d. 1930) and Vally Honig. Vally had remarried in 1938, to a Norwegian; nonetheless she was deported to the Auschwitz concentration camp in 1942. The director of the Österrichische Galerie, Bruno Grimschitz, prepared the property declaration of her collection, which included a few Waldmüllers, but not the one in question (see Sophie Lillie, Was Einmal War, Vienna, 2003: 521-523), and as Grimschitz was an expert on Waldmüller's work, there is little chance he would have misidentified the paintings in the Honig collection at the time of Mrs. Honig's deportation. It is therefore possible that Honig was the seller of the painting in question in 1917. In 1957 Grimschitz lists the location of the painting in question as unknown (Ferdinand Georg Waldmüller, Salzburg, 1957: 287, no. 130). Ferdinand Georg Waldmüller Gedachtisausstellung, Residenz, Salzburg, 1953, no. 8. Roessler and Pisko. Ferdinand Georg Waldmüller: Sein Leben, sein Werk und seine Schriften. Vienna, 1907: unnumbered. Roessler, Arthur. Ferdinand Georg Waldmüller. Vienna, 1908: unnumbered. Grimschitz, Bruno. Ferdinand Georg Waldmüller. , 1957: 287, no. 130, repro. Schroder, Klaus Albrecht. Ferdinand Georg Waldmüller. , 1990: 16, repro. Feuchtmüller, Rupert. Ferdinand George Waldmüller. , 1996: 431, no. 137, repro. Conisbee, Philip. 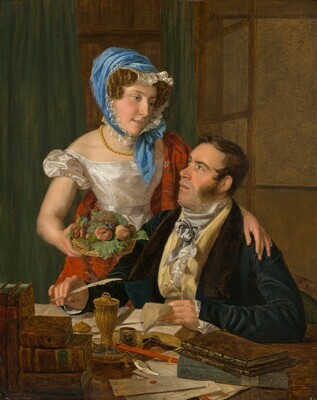 "Ferdinand Waldmüller, The Cartographer Josef Jüttner and His Wife." National Gallery of Art Bulletin no. 36 (Spring 2007): 20, repro.